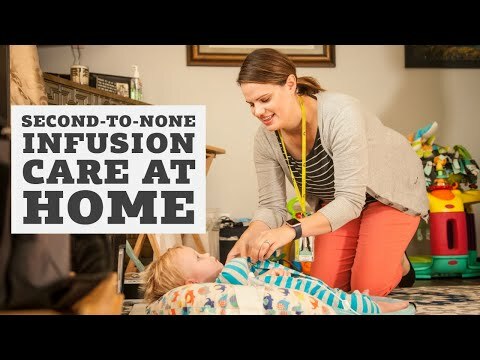 Receiving infusion care at home can help ease families’ stress of dealing with illness or a medical complexity. And for children, it means less time in the hospital and more time to simply be a kid—at home. Pediatric Home Service offers infusion therapy and other comprehensive home care services throughout Minnesota and Wisconsin. In some cases, PHS may coordinate with a trusted partner organization in your area to directly provide the service. Children have unique needs, and PHS’s specialized infusion nurses work with our infusion pharmacy team to get to know your child and family, so we can provide not just integrated care, but also comfort. When the child requires total or home parenteral nutrition (TPN/HPN) our nutrition support team collaborates to make sure every aspect of the child’s care is considered. From infusion assessment and administration to education and lab monitoring, PHS will support you and your child every step of the way. Whether you are switching providers or just coming home from the hospital, we’ll make the transition as seamless as possible- so that your entire family can live healthier and more fulfilling lives at home. PHS’s pharmacy services mean a more integrated approach to your child’s home care. Infusion nurses and pharmacists are available 24 hours a day, every day of the year to answer questions about treatment or how a medication works in your child’s body. Receive articles and helpful tips from PHS.